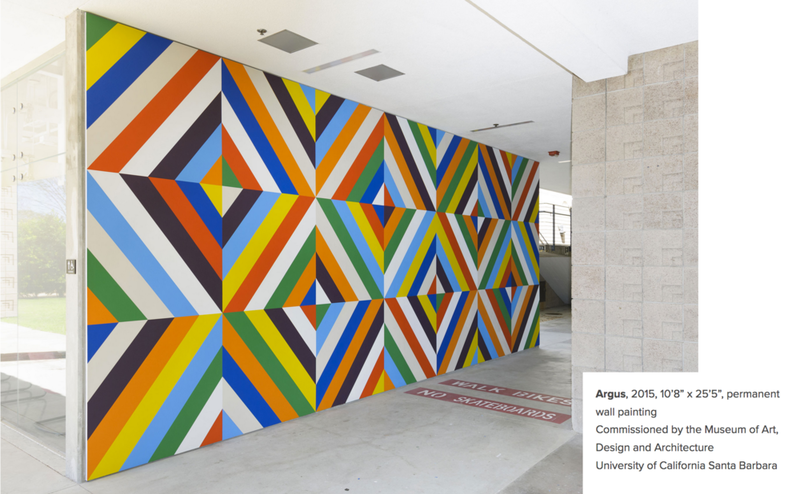 Stephen was an Artist in Residence in 2015, through a partnership with the Museum of Art, Design, and Architecture at the University of California, Santa Barbara. Stephen Westfall, who attended UCSB as both an undergrad and grad (BA 1975, MFA 1978) was commissioned to execute a massive painting covering all four walls of Nachman Gallery. Westfall's signature hardedge, geometric brand of abstraction will transform the gallery surfaces into a series of multicolored diamonds, clustered together and floating individually according to an underlying pattern of arrangement. Westfall's design is based on his longstanding investigation of grids, color arrangements, signs and painterly influences that include Picasso's harlequins, Matisse's dancers and Renaissance figures.